Even as the global economy was in trouble, Barclaycard leaders were clear they needed to look to the future. The company was transforming beyond the traditional credit card business. Both innovation and implementation of strategy were essential to achieve the vision. 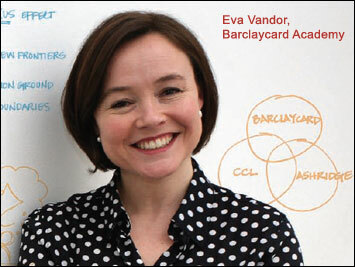 Eva Vandor, head of Barclaycard Academy, was tasked with ensuring that the company had the skills to transform the business while managing external turmoil. The result: Barclaycard developed its Executing Strategy Programme, which was launched in 2010. Eva, along with Head of Leadership James Prior and their team, sought to provide leaders a full and shared perspective on the direction of the business, but also to develop key leadership capabilities. Among the most crucial: to collaborate effectively. The Executing Strategy Programme — developed in collaboration with CCL and Ashridge Business School — was designed to boost managers’ ability to lead across boundaries, take risks, introduce change, accept uncertainty, inspire team members and stimulate their creativity to break through the status quo. The nearly 100 leaders who participated in the Executing Strategy Programme have increased their leadership effectiveness, openness to others’ perspectives and ability to collaborate, according to a program evaluation conducted by CCL. Leaders also report a new focus on establishing strong connections, alliances and networks — and leveraging them to benefit the business.